Inspired by Tucson's Nur Market on Speedway Boulevard, and by his doctoral coursework and his immigrant experience, UA second language acquisition and teaching student Christian Ruvalcaba launched the Language Capital Project and corresponding website to map where native speakers of non-national languages come together. "Many young people who arrive in the U.S. try to fit in by talking only in English, due to some of the pressures to assimilate and the stigma around speaking a foreign language," Ruvalcaba said. "We hope that language diversity projects like this can help the Tucson community see the value in promoting and welcoming the linguistic wealth around us." The project aims to help non-national language speakers locate where fellow speakers gather, while serving a resource for new residents to connect with established immigrants and refugees, encouraging the unity and growth of Tucson's minority language communities. Ruvalcaba, with life and project partner Michelle Aguilera, found that Tucson boasts more than 300 locations of non-English speaking populations with 71 distinct regional language varieties — with the most common being variations of Chinese, Spanish and Arabic. "We have been finding that people are often surprised to see there is so much linguistic diversity in Tucson. We hope that another result of mapping out these types of locations can show that multilingualism and multiculturalism is actually the norm throughout the world, even if we sometimes cannot see it or hear it around us," Ruvalcaba said. Aguilera, a doctoral student in the Department of Teaching, Learning and Sociocultural Studies, said they view the project through a social justice lens to ensure that the work they do is rooted in collaboration with members of the community. The locations vary as much as the languages do, but the majority of the locales are restaurants, grocery stores and doctors' offices. Since its inception in 2015, the Language Capital Project has received a 2016-2017 Confluencenter for Creative Inquiry Graduate Fellowship, a GPSC Student Showcase community award and several travel awards to present this work to other universities. 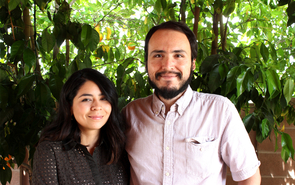 "The work by Christian and Michelle reflects the strong relationship between people and place that has characterized the intellectual endeavors of most of Confluencenter's projects," said Confluencenter director Javier Duran. "By linking our diverse demographics to the ways in which folks use language in a variety of ways, the project creates a fascinating mapping of how Tucson operates as a complex, sociocultural community. The project captures the commitment of our center to vigorously engage research ideas with community realities." David Malinowski, the language technology and research specialist at The Yale Center for Language Study, to start "Languages of New Haven"
Shinji Sato, the director of the Japanese Program in Princeton University's East Asian studies department, to launch "プリンストンの日本"
Hiram Maxim, a professor in Emory University's German studies department, to hold a workshop that later developed into "Mapping Atlanta's Linguistic Landscape"
"Initially, it was just a fun side-project, but we really had no idea if there was a lot of interest in it beyond our friends and other students," Ruvalcaba shared, saying that faculty supporters encouraged him to seek funding. Then, Heidi Harley, a professor in the UA Department of Linguistics, encouraged him to apply for a Confluencenter Graduate Fellowship. "The fellowship opened a lot of doors for us. It allowed us to finance multilingual outreach materials for collaborators on and off campus, and hire an expert to develop the map application," Ruvalcaba said. "In addition to the funding, though, the fellowship in many ways legitimized the project as something useful and meaningful, and gave us a supportive relationship with Confluencenter staff and other fellows." Reflecting on what motivated the project, Ruvalcaba said: "A lot of the inspiration was connected to needing a break from studying formal syntax." The non-national languages spoken at Tucson's Nur Market, 3565 E. Speedway Blvd., made Ruvalcaba think that it would be interesting to see how many other languages he could find in these types of Tucson shops. Learning about sociolinguistics, second language acquisition research and the use of technology in language teaching also served as a source of knowledge and inspiration for the project, Ruvalcaba said. The other source of inspiration was his own experience immigrating to the U.S. at the age of 6 with his family. "When you arrive in a new country, it is really difficult to find information that seem obvious to others, like how and where to find a job, a good school or stores that have familiar foods. Some forms of information that help you survive, stay out of trouble and re-adjust to a new surrounding is communicated by word of mouth," Ruvalcaba explained. "My parents got advice and information at church because the Spanish mass brought many of the scattered Spanish speakers in town together in one building. Even now, when I am in an unfamiliar city, I seek out Spanish speakers, or people from Mexico," he said. "Around them, I can find an island of familiarity and also information about other people of a similar background in a new place. In that way, language becomes a sort of key to these supportive networks."